It’s that time of year again folks: the final seasonal outlook for 2015. It’s time to sit back and reflect on what’s been a season full of drama, heroes, villains and last minute twists. We will also take a sneak peek at what’s on the way. Will September be a sizzler or will we manage to keep rolling double sixes and defy the odds to keep the snow cover going for longer? We started this winter apprehensively lurking in the shadow of the all powerful El Nino. We were clutching at straws to try and look for signs that maybe it would shape up to be a “wrong’un” and we could get some decent snow through the door against all odds. June and the first half of July confirmed our worst fears. “Classic” El Nino conditions crushed our hopes. I spent many a night desperately looking for any signs of a brave low on the horizon. The very fact that the resorts opened and we started skiing was mainly thanks to artificial snowmaking. Then, in mid-July, winter struck back. 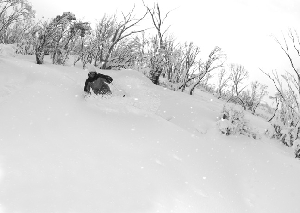 A couple of deep lows steamrolled in from the south-west dropping decent 40-50cm dumps. 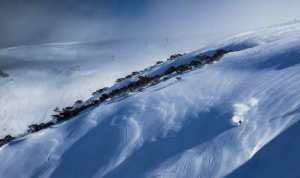 This saw the snow pack grow 100 cm in July transforming the Aussie Alps from a patchy quagmire into a winter nirvana. The collective depression suffered earlier in the year became a distant memory. A third low forecast for the start of August would have been the cherry on the cake but it didn’t quite materialise. The models backed off a couple of days before it was due to arrive. High pressure then reared its ugly head again for a couple of weeks, the temperatures rose, we even got a bit of rain. Maybe it was premature to celebrate? After all we were in an El Nino year. Anxiety rose in proportion with the increasing temperatures. Could this warmer weather last till the end of the season? Luckily, that didn’t happen. We may have lost the dump of snow we wanted at the beginning of August but we got an unexpected ‘Sneaky South-Easter’ in the end. Much like Rocky, a small low with humble beginnings in the heart of Australia slowly gained energy before positioning itself perfectly over NSW to help keep our season going and fight off the El Nino ‘Apollo Creed’. We didn’t give it much credit to begin with as it looked like it would skim the Aussie Alps but boy oh boy, didn’t he pack a punch? 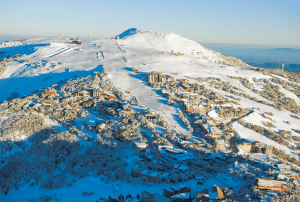 NSW resorts got 40-50 cm of wet snow. The sun is now starting to claw its way back like a cat on heat. The two crucial parameters that will determine how quickly the base disappears are temperature and future precipitation. 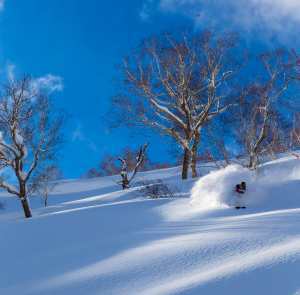 What we want are cold south-westerly winds and a couple of lows to top up the snow pack. The worst case scenario would be high pressure to the east with warm northerly winds which could see us lose 100cm of snow in a month. As we are currently under the influence of a strong El Nino I thought it would be interesting to look at past El Nino years to see if there were any significant temperature or melt trends during these years. 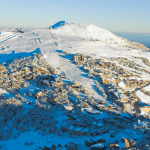 The average mean maximum temperature at the Thredbo Top Station in September is 3.4ºC – there is no getting away from that. During El Nino years the average temperature is 3.3ºC – no different to a normal year. Dividing the El Nino years into “wrong’un” and “classic” we also fail to find any significant difference. Total melting from the end of August to the start of October has varied year to year during El Nino years. In 1991 and 1994 the snowpack was maintained. In 2006 we lost all our snow cover by the 1st of October. These are exceptions to the rule as we find that in most years 40-50cm of snow is lost which is not much different to the 55 cm of a normal year. Slightly more is lost in a “wrong’un” year but that could be because there is more snow to lose! This year has a remarkably similar snow profile and El Nino strength to 1997, but that doesn’t mean that the melt in September will be the same. What’s the speak on the Creek? Taking the model forecasts into account, the odds are that we have already reached our peak snow depth of 145 cm which is not bad for a strong El Nino year. Yes, I know, I know, I have already given myself a pat on the thorax. It could be a lot worse (1982, 2006, Cough Cough). 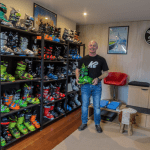 But, an El Nino year is an El Nino year at the end of the day – it is hardly surprising that we fell short of the long term peak snow depth average of 176 cm. This winter has been somewhat of a hybrid, high pressure hasn’t established itself enough to merit a “classic” but we didn’t get the snow totals of a full-on “wrong’un”. The base should more or less maintain itself for the first week of September with a bit of wet snow up top and coolish temperatures. It then looks like we will slowly and surely lose snow until October. Temperatures will be around average to slightly above. With low amounts of snow on the cards I predict that we will lose between 60-80cm of snow by the end of the month leaving us with a base between 65-85cm by the last week of September. The base will be thinner in VIC as they did not get the benefit of the last snow storm. No need to be gloomy though, that kind of base is better than June and the first half of July! My advice is to get up to the mountain during the next couple of weeks. Leave the stress of the city behind, enjoy the Spring snow and cuddle up to a gum tree. We survived El Nino this year. This will be my last seasonal forecast for 2015. I’ll catch you next year when we’ll hopefully have started to shake off the current El Nino. Until then you can keep up with my day to day forecasts. That’s all from the Grasshopper. If you’ve got a different theory on what’s going to happen this September, or just want to provide feedback, then please hit me up on the discussion below. Or you can follow me on facebook.